In June, 2010, I boarded an American Airlines Boeing 777 in Frankfurt. This flight bound to Dallas Fort-Worth and then to Jacksonville was the first step of a life-changing experience. Together with Jason Schappert of www.m0a.com, we had planned a flight from Florida to California and back in his Cessna 150. After over a year of preparations, the Flying Across America project was finally starting. The flight took us from Dunellon in central Florida to Daytona Beach in order to make it a real coast-to-coast flight. We flew Jason’s 150 all the way to California’s Catalina Island and back in 62 hours of flight time spread over 23 days. It was a glorious flight that produced countless encounters with other aviation enthusiasts and the general public. Does this qualify me to be an Airplanista according to Dan Pimentel’s definition? I do like to think so! This journey to Fly Across America was also the opportunity to advocate for General Aviation in various media and in front of various audiences. This trip was also my first visit to the United States, making it even more of a learning experience. The biggest lesson I learned from this adventure, from my European perspective, is that pilots in the U.S. enjoy an aviation system that works well and has a great amount of freedom. I don’t want to dive into all the differences between flying on both sides of the Pond or criticize the European General aviation system. 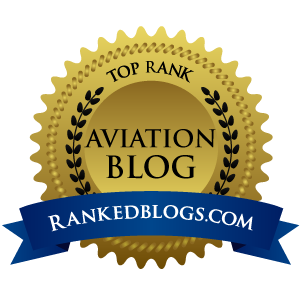 This would be unfair, especially considering that in other parts of the world, General Aviation simply does not exist. Aviation in the U.S. has a different history than anywhere else in the world. No other country has such a dense network of airports or relies as heavily on aviation. No, my point is to remind all U.S. pilots that seen from abroad, they live and fly in aviation paradise. Naturally, it’s not perfect, and yes, General Aviation in the U.S. is sometimes under attack. This is why I want to write something here that I repeated several times during our Flight Across America: Do not take this freedom for granted. Don’t expect others to defend it. It is the duty of each and every pilot to be an ambassador of aviation, and not only within the flying community. Help GA by spreading the word, by helping to initiate the next generation of pilots, and by explaining to people all the benefits that GA brings to the community. There is no need to be good at mathematics to understand what would happen if each pilot could pass the passion for flight on to only two newcomers. Amongst the many people we met during the trip, some were complaining as they recalled the “good old days”, when everything in aviation was easier, and flying was cheap and simple. This somehow made me smile because everything still is way easier, cheaper and simpler in the U.S. when compared to anywhere else in the world. My reaction when confronted with pilots talking about the good old days is always the same. I understand that they have known easier times. But then I ask them what they do NOW, to improve the GA situation? 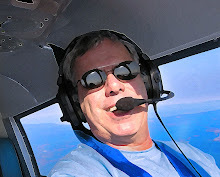 I try to give them hints and ideas how they could get more involved in the community, to speak positively about GA. Aviation is only 50% about flying, and the remaining 50% of your time as an aviator should be spent working to protect the freedoms to fly. I will never forget how I realized the aviation community exists worldwide when I found the latest issue of AOPA Pilot Magazine in the home of a friend while staying at his place in California during the Flying Across America flight. That same issue had just arrived at my home in Frankfurt just days before leaving for the U.S. It reminded me that aviation fans are part of a great community, and it is our role to make this community expand and prosper again. 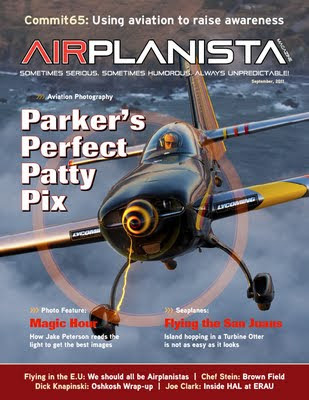 If you don’t want the U.S. aviation paradise to shrink, pass this issue of Airplanista along to someone else, until there’s one in every pilot’s inbox in America. I challenge you right now...to whom will you send it? Choose the method most suitable...copy this link: http://ow.ly/5fdEi, click here to post on Facebook, or click here to post on Twitter.